"There is the music of heaven in all things"
Hildegard, a truly remarkable woman, was the tenth child born to a noble family. As was customary with the tenth child, which the family could not count on feeding, she was considered a tithe and dedicated at birth to the Church. Hildegard produced major works of theology. She was highly respected and advised bishops, popes and kings. She is the first musical composer whose biography is known. She founded a vibrant convent where her musical plays were performed. 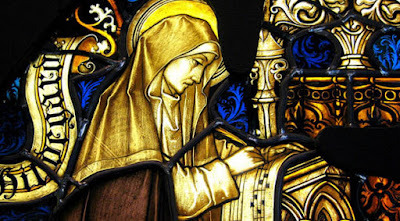 Hildegard was an abbess, writer, composer, philosopher, Christian mystic, visionary, and polymath. She is considered the founder of scientific natural history in Germany. She wrote theological, botanical, and medicinal texts, as well as letters, liturgical songs, and poems and supervised miniature illuminations.